We’re excited to welcome actor, singer and musician Trevor Dion Nicholas to American Eye. Trevor hails from West Virginia via Broadway. He recently moved to London and is currently wowing the crowds in his West End stage debut as Genie in Aladdin the Musical. Judith Schrut spoke to Trevor in his dressing room ahead of the show’s opening. Tell us a little about growing up in West Virginia. I could describe that in three words: mountains, snow and family. I’m the youngest of five in a really close family, ten years younger than my next sibling. I’ve been lucky with my place in the family as I had the attention of a single child with the nurturing of a large family. Who’s been your biggest inspiration in your life and career? My parents, Bobby and Doris, have always been inspirational and supportive in my life and career. Dad’s a singer and I grew up watching him perform. Mom’s a social worker with a big love of theatre and music; she’s been a huge inspiration as far as my work ethic goes. I watched her fight and struggle and push to earn her doctorate in social work while taking care of our family. She taught me that if you want it, you should push for it. What sparked your interest in theatre? My parents were both big theatre fans. When I was young, we’d often just get in the car, the 3 of us, and drive to places like NewYork or Toronto to see shows. All the way there and back we’d listen and sing along to recordings of great musicals. That was my first exposure to theatre. I’m very happy that both Mom and Dad are coming over for the London press night of Aladdin. We understand you’ve brought your family with you to London. How are they finding it? Yes, my wife and two young children are here with me, and the kids are going to a nearby English school. They love their new school and their friends in London. They love the museums, they love the food...we all do! The accessibility to lots of different food and art and culture is great. What most excites you about being in Great Britain? This is my first time in the UK, ever! I’m most excited about doing Aladdin here, getting to build this new version for British audiences. I’m also excited about the ease of travel so I can expose my kids to as much of Europe and the UK as I can. And for an old theatre nerd like me, London is amazing, like being in the birthplace of all that. There’s this pumping, beating heart here that you just don’t get anywhere else. Please share with our readers a little more about the show. It’s all about magic, friendship, love, glitz and glamour! My favourite moment is when the lamp is rubbed and I first enter as the Genie. You can feel the excitement in the audience, and my adrenaline goes through the roof. It is the most exhilarating and awesome moment, the best time! What would you advise Americans in Britain, especially families, not to miss while they’re here? My family and I had a real blast at the Udderbelly Festival, a cool, outdoor, bohemian style festival happening on London’s South Bank all this summer. There was so much energy, I can’t wait to go back. The museums are unmissable, especially the Science Museum. And theatre of course. I believe the younger you can expose kids to live performance the better. My advice would be, whether you’re here for a short time or long time, enjoy as much of the culture and history as you can. And your recommendations for ‘eating American’? The best American chicken wings I’ve had was at the Hippodrome Casino. And I hear Maxwell’s do really good ribs. Are there any American pleasures you particularly miss? I’m pretty adaptable but I do miss my bakeries! Specifically, the Hummingbird Cake at New York’s Magnolia Bakery. And the incredible rice pudding at Rice to Riches. We hear you consider yourself a Foodie, that you enjoy cooking and you’re an especially big fan of brunch. So, who would you invite to your fantasy brunch? Yes, cooking is my solace. I love to cook, to feed people. I got that from my parents. The preparation, the presentation, the act of creating something right there with your hands that people enjoy. And I do love my brunch! I’d invite as many of my friends and family I could feed at one time. And the US President of course. How cool would that be? To have the Obamas over for brunch and impress them with my poached eggs! I’d definitely want my favourite chef, Alton Brown, to be in charge of food. We could hang out together! And I’d definitely want my indie rock band, Neighbourhood Goliath, to come and play some great music. 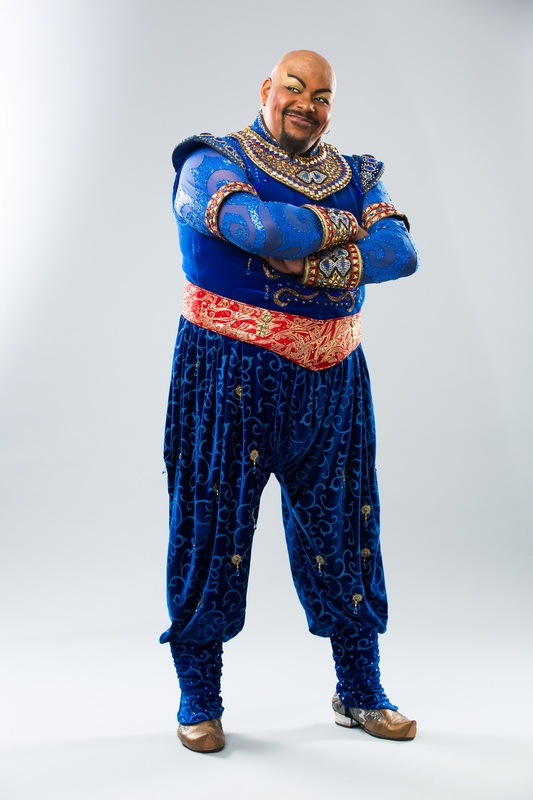 You can experience Trevor’s Genie in Aladdin, now showing at London’s Prince Edward Theatre www.aladdinthemusical.co.uk. And tune in to Trevor’s tweets at twitter.com/astonishingtrev. Hailed as the world’s greatest festival of classical music, the BBC Henry Wood Promenade Concerts, affectionately known as The Proms and a national treasure since 1895, roll into town mid-July, filling London’s Royal Albert Hall with 93 concerts and 9 weeks of sumptuous sound, ending with the legendary Last Night of the Proms. But the Proms are much more than a chance to savour a delicious feast of international orchestras, conductors, choirs and soloists. This year’s Proms proudly present 30 world and UK premieres and 132 debut artists. You’ll find a David Bowie Prom, Gospel Prom, CBeebies Children’s Prom, an Erik Satie Cabaret and a Strictly Prom dance extravaganza, plus dozens of extra events, talks, films and workshops. The season also sees Proms in some unusual places like the Roundhouse, Greenwich’s Old Royal Naval College and Bold Tendencies Multi-Story Car Park in Peckham. American musicians and performers are always well-represented. There will be a Prom applauding six decades of jazz and popular music by Quincy Jones, a Prom saluting Duke Ellington’s groundbreaking, Shakespeare- themed Such Sweet Thunder and the magnificent John Wilson Orchestra greets George Gershwin’s 120th birthday with a magnificent tribute night. The charismatic Marin Allsop is back to conduct two concerts. Prom seats are affordably priced and every concert famously features Promming tickets for £6, enough for 900 Prommers standing in the central Arena and a further 500 standing, sitting or even lying down in the upstairs Gallery. Every Prom is broadcast live on BBC Radio 3 and online, with many also televised. For the Last Night on 10 September, the Proms spill out from the Royal Albert Hall onto open spaces around all four countries of the UK for Proms in the Park. There will be music and merrymaking at Belfast’s Titanic Slipways, Glasgow Green on the banks of the Clyde, Parc Eirias in Colwyn Bay, Wales and Hyde Park in London, culminating in a cross-country link up of flagwaving, fireworks and passionate singalong-ing to Land of Hope and Glory, Rule Britannia, Jerusalem and the like. Should you be unable to get to a Last Night event, you can still watch, wave your flags, pop your party poppers and singalong via giant public video screens around the UK, or enjoy the magic of the evening live on radio, laptop or TV in the comfort of your own home, courtesy of the BBC. Other outstanding choices for classical music lovers this summer include the York Early Music Festival, Cheltenham Music Festival and Westminster Abbey Summer Organ Festival, while opera lovers can gorge on Glyndebourne, Garsington and Opera Holland Park. Foodies are in for a fabulous season of culinary delights as summer Britain becomes a food lover’s paradise. Amongst a cornucopia of summerlicious events are esteemed traditions like strawberries and cream at Wimbledon- time, cockles, whelks and winkles by the seaside and picnic teas in the park. You can opt for tastings, chef demos and local producers galore alongside botanical brilliance at the Hampton Court Flower Show, or eat your heart out at themed fests like Pembrokeshire’s Fish Week, Isle of Wight’s Garlic Festival or Hoxton, London’s Great Indian Food Feast. Indulge in some serious supping at classic events like Ludlow Food Festival, where this year’s highlights include a Sausage and Ale Trail, tastings of 300 puddings and dozens of free cookery workshops for kids. Turn up the heat with Grillstock, Bristol’s annual family-friendly barbecue feast of ‘meat, music and mayhem’ where you can take part in chili pepper, hot dog and hotwing eating competitions and cheer on teams such as Smokus Pocus, Grillers in the Mist and Apocalypse Cow as they compete for the coveted title,‘King of the Grill’. You can even satisfy those Fourth of July yearnings with a PBJ hot dog and champagne at Fitzrovia, London’s Bubbledogs or an old-fashioned Louisiana crawfish boil at Dalston’s Pamela Bar. Or, save your alfresco appetite for the Port Eliot Festival, where food takes centre stage. Port Eliot is a uniquely creative and laid back festival of words, imagination, fashion, flowers, music and a well-deserved reputation for phenomenal food. Over the Festival’s extended weekend, a mellow mix of local chefs and top foodie legends offer talks, tastes and demonstrations celebrating all aspects of food from planting and growing to prepping and eating. Summer eating is obviously thirsty work. That’s where the London Craft Beer Festival comes in, with 30 top independent breweries bringing over 250 of their best beers for you to sip and savour along with great music and abundant food. There’s also the Great British Beer Festival at London’s Olympia, where you can partake in tutored tasting sessions, enjoy traditional pub games and sample real ale from hundreds of breweries across the UK as well as an unparalleled range of international beers. Make a date with history this summer as 2016 Britain celebrates a bevy of birthdays and anniversaries. Our beloved and oldest-ever monarch, Queen Elizabeth II, is 90 this year, so join the nation as it says “Long Live the Queen” and Her Majesty generously shares her love of horses, corgis, pomp and pageantry with her subjects in a year-long birthday party. Royal revels include street parties in villages and towns across the UK, a Windsor Castle ceremony as the Queen lights the first in a chain of 900 beacons, and a service of Thanksgiving in St Paul’s Cathedral. The Clean for the Queen project calls on the country to show its gratitude by joining in a nationwide clean-up campaign, while the Patron’s Lunch promises the world’s largest-ever street party, with 10,000 guests invited to the Mall near Buckingham Palace for feasting and fundraising in honour of the Queen’s 600+ sponsored charities. In case you haven’t yet received an invitation, the event will be broadcast live on the BBC and on giant video screens in a Royal Park near you. Expect plenty of bunnies, beavers and badgers on hand for the 150th birthday of Beatrix Potter, writer and illustrator of children’s favourites like The Tale of Peter Rabbit, Jemima Puddle Duck and The Roly Poly Pudding. Beatrix was one of the Lake District’s most famous residents, so 17th century Hill Top Farm, her former cottage home turned National Trust museum, will be hosting special events throughout the summer. There will be tours of Hill Top and its lovely gardens, birthday picnics, guided walks and storytelling Saturdays. Nearby Hawkshead Gallery will have a charming display of original illustrations. Not only was Ms Potter a prolific author and artist, she was also a passionate farmer and conservationist, an expert on mushrooms, a prize-winning sheep breeder and the first woman president of the Herdwick Sheepbreeders Association. Hard to believe that Peter Rabbit, her first ‘little book’, was rejected by several publishers so she had to print it herself. It was an instant and huge success. Since then, her works have sold over 100 million copies and have been translated into more than 35 languages. Further south, the Roald Dahl Museum in Buckinghamshire, celebrates the 100th birthday of the late, great Roald Dahl, author of Charlie and the Chocolate Factory, Matilda, The Witches and The BFG. Step through the Museum’s chocolate doors, dress up as your favourite Dahl story character, enjoy workshop and craft activities in Miss Honey’s Classroom and visit Dahl’s famous Writing Hut. One of the finest musicians of all time, violinist Yehudi Menuhin, would also have been 100 this year. Born in New York, raised in San Francisco, renowned as the ‘Miracle Boy’ who gave his first solo concert aged 8 and was world famous by 13, Menuhin spent most of his adult life in England, where he founded the famed Yehudi Menuhin School and taught and inspired generations of young musicians. Celebratory events include an exhibition and Magical Musical Journeys Workshops for families at the Royal Academy of Music and a series of concerts at Kings Place. Last but not least, Britain makes much ado about William Shakespeare in the 400th anniversary of the Bard’s death in 1616. In his relatively short life– he died in his early 50s– the greatest writer in the English-speaking world penned an astonishing 38 plays, 154 sonnets and dozens of quotable quotes. Shakespeare’s Globe in London and The Swan in his birth town of Stratford upon Avon, are marking the occasion with numerous exhibitions, performances and events. From the hidden gardens and spectacular lawns of Savill Garden, Windsor Great Park, comes an immersive production of As You Like It, with a mouth-watering gourmet BBQ served to the audience during the final wedding scene.You can also enjoy a summer evening of open air theatre at its very best as The Lord Chamberlain’s Men perform Much Ado About Nothing, Shakespeare’s sparkling battle of the sexes comedy, in the majestic riverside setting of Ham House near Richmond. So, what’s not to celebrate? Image 2: The inspirational Yehundi Menuhin. Photo copyright BildZeitung.